The Fuji X-T1 v4.0 firmware upgrade appears to unlock a whole new array of autofocus modes and options, and this is the second time Fuji has issued an upgrade that substantially increases this camera's capabilities. The 'firmware' is essentially the operating system that controls your camera, and it's common for camera makers to issue 'maintenance' updates to fix problems you didn't know you had or add features you didn't know you needed – but it's not at all common for a firmware upgrade to add new features on this kind of scale. The v4.0 firmware update will apply to both the orginal black X-T1 and newer X-T1 Graphite Silver Edition. The biggest change is that it brings a new AF system with upgraded performance and new features. It follows on from the v3.0 update in December 2014 which itself introduced a whole raft of great new features, including an electronic shutter, Classic Chrome film simulation mode and 'Natural Live View' viewfinder display. The firmware update obviously can't change the autofocus hardware built into the camera, but it does appear that Fuji has found new ways to use it. The current camera offers a 49-point autofocus system, but the firmware update adds new 'Zone' and 'Wide/Tracking' modes which use 77 AF points across a wider area. 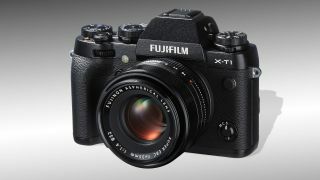 Fuji says this will 'substantially' improve the X-T1's ability to capture moving subjects. The X-T1's new 'Zone' and 'Wide/Tracking' modes use 77 AF points across a wider area and should bring 'substantial' improvements for moving subjects. The Zone mode offers 3x3, 5x3 or 5x5 focus zones from the 77 AF points now available, and it's designed to work with the continuous AF mode, where the centre AF point is used to track a moving object. This sounds rather like Nikon's Dynamic Area AF mode, which also uses a 'cluster' of AF points. The Wide/Tracking mode works slightly differently. Here, the camera tracks moving subjects across the full 77-point AF area, not just following horizontal and vertical movement but back and forth movement too. Fuji says the single-point AF option now divides the focus area into smaller sections to measure the subject distance more accurately. The sensitivity of the camera's on-sensor phase-detection pixels has been improved too, with a detection range of 0.5EV – previously, it was 2.5EV. This should make the camera much better at focusing in low light or with low-contrast subjects. The sensitivity of the X-T1's phase detection pixels has been improved for better low light photography. Face-detection AF gets a boost too. Face-detection AF modes are all very well, but when you're working with large apertures and shallow depth of field you need to be more accurate. In any portrait shot, your subject's eyes are the one thing that needs to be sharp, and that's what the new Eye Detection AF mode is designed to achieve. Fuji makes a number of premium-quality fast prime lenses, and this mode should enable users to exploit their shallow depth of field and bokeh effects in portrait shots more easily, and with more precision. The new Eye Detection mode takes face-detection AF to a new level by focusing on your subject's eyes. The Macro mode operation has been improved too. Previously, you had to press the X-T1's Macro button to shoot close-up subjects with normal AF speed, but the with v4.0 firmware update the camera will switch modes automatically. This leaves you free to re-assign the Macro button to some other function of your choice. In addition, Fuji says optimised autofocus algorithms will also provide a smoother and more natural-looking autofocus action when you're shooting video. Firmware update 3.0 introduced a new electronic shutter, and this update changes the operation of the shutter speed dial in T mode so that when the Shutter Type is set to Mechanical + Electronic you can adjust the shutter speed across the full range from 30-1/32000 sec without changing your grip. Fuji says this will be especially useful for those using the VG-XT1 vertical battery grip. The EV compensation dial can now be used to make exposure adjustments in Manual mode when Auto ISO is selected, the optional framing lines in the viewfinder, designed as an aid to composition, have now been made finer so that it's easier to see your subject and, just to avoid confusion, the old 'Silent Mode' is now called 'Sound and Flash Off'. The X-T-1 v4.0 firmware will be available from the end June 2015 from the Fuji website.